For thousands of years rural China remained unchanged. In the urban areas warlords fought each other and invading Mongols, for control of what was the most advanced country in the world. Then as Europe strengthened, China weakened until the communists took over in 1949 and changed every aspect of life. “The Chinese” tells the story of Confucius, who laid down China’s true values, Admiral Cheng Ho, who sailed his mighty fleet to Mecca and Zanzibar, and Mao Zedong, who became the virtual dictator of modern China. The West has always been fascinated by China. For thousands of years they were probably the most advanced civilization on earth. No people were more aware of their superiority than the Chinese themselves. To protect their way of life they cut themselves off from the rest of the world, but from the 1600’s on, western development caught up and surpassed China. The non-acceptance by the Chinese of this fact eventually caused them to lose their leadership position and become exploited by the people they considered barbarians. In the first century CE, the Roman Empire traded glass, precious stones and perfume for Chinese silk along the “Silk Road,” a tremendously long land route through the middle of Asia. Then, for more than a thousand years, there was no contact at all. In 1265 some traders from Venice (in Italy) managed to obtain an invitation to visit China. Their names were Nicolas and Maffeo Polo. Accompanying them was Nicolas’s son, Marco Polo. The only reason they were able to travel that far east was because the (pro-trade) Mongols controlled the whole area. (See “The Mongols”). The ruler of China was Genghis Khan’s grandson, Kublai Khan. Marco Polo spent over twenty years in China and it was the story of his adventures that fascinated Europe. When the Mongol Empire collapsed, the Middle East reverted to Muslim control and Europe was once again cut off from China. In 1497 Vasco Da Gama found a sea route around Africa to reach China and in 1511 the first Portuguese ship arrived at a Chinese port. Dutch and British traders followed. Their greed and lack of understanding, plus the Chinese disinterest in learning from the West, resulted in dramatic changes that are still going on in China. In this section we look at three people who represented three different Chinese directions. The first is Confucius (551 BCE-479BCE) who captured the essence of Chinese values and taught them the way they should live their lives. 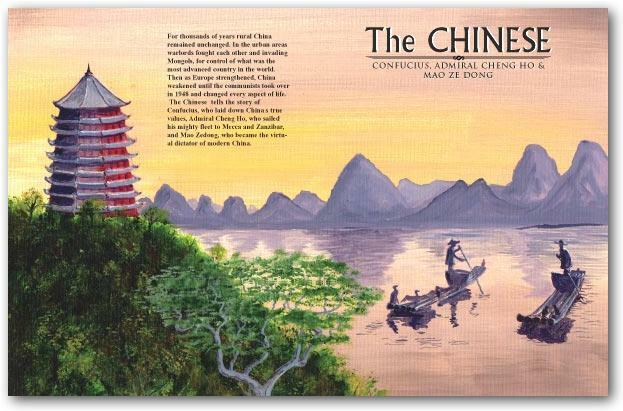 The second person is Cheng Ho (Zheng He),(1371-1435 CE) who is the most famous sea traveler in Chinese history. The third is a more recent ruler — Mao Zedong (1893-1976 CE) who converted his country to Communism then almost wrecked it. Hundreds of years before Europe, the Chinese were making paper, printing text and pictures, making fireworks, gunpowder, umbrellas, the compass, clocks and were casting iron. They also had a single written language that read the same no matter which dialect of Chinese was spoken. They were highly organized, with the best civil service in the world and produced beautiful paintings, bronze castings and jade pottery. They also knew the secret processes to making silk and porcelain. They used paper money and transport canals with sophisticated locks. Other archaeologists have found ruins of settlements from 7,000 years ago. The Bronze age started about 3000 BCE and by 1600BCE the first of a number of dynasties (a series of rulers related to one another) started — the Shang dynasty was followed by the Zhou dynasty (1100-221 BCE) and during this period a wise man called Confucius emerged. His message was about love, kindness and respect at a time but, all around him, power was being abused. It reached its worst period from 221 to 210 BCE when Qin-Shihuangdi (259-210 BCE) became the first emperor of all of China. To strengthen his rule Qin ordered works of literature to be burned and had 400 scholars buried alive. Obsessed with living forever, he sent hundreds of boys and girls into the sea. They all drowned in their attempt to find the magic plant of long life. This cruel man was buried in an elaborate tomb near the town of Xi-an. Work on the tomb was started as soon as he became emperor. It took 700,000 workers ten years to finish. Lined with copper it contains a model of the royal palace with numerous objects. Its full extent was not known until 1974 when farmers digging a well, a mile from the emperor’s tomb, came across an underground army made of clay. When the site was eventually cleared, 6,000 soldiers were revealed, each with a different face, hairstyle and expression. Some soldiers had chariots drawn by horses. Later, a second site was found containing 1600 soldiers. Qin had surrounded himself with a terra cotta army to protect his soul in the after-life. After Qin’s death a peasant uprising produced the Han dynasty in 202 BCE and China through good government and agriculture became rich and powerful. There have always been power struggles in China but there were periods of relative peace, like the Tang dynasty (618-906 CE). This was the golden age of Chinese history when arts, poetry, building and agriculture flourished, way ahead of a dark Europe. The capital city, Xian, like Peking, was one of the largest cities in the world, with residents from Korea, Japan, Burma, Arabia and Persia. Even international polo matches were played at the Palace. China had always been plagued by raiding barbarians from the north and west and had built a great wall to protect their civilization from outsiders. There were gateways to allow legitimate traders through the wall. After travelers walked through these gateways, they were astonished by what they saw! Organized villages clustered around crossroads and beside rivers: little farms were everywhere, and each had tiny fields checkered around them. Even apparently wild woodlands in the mountains were in reality carefully planted and trees regularly cut as they reached full growth. No land was wasted. But the great Mongol leader Genghis Khan was one barbarian too many, and after many years of battling their skillful army, China submitted to Mongol rule. The Mongols established the Yuan dynasty and in 1271 moved the government to Peking (Beijing). The Mongols used foreigners in their government, including Marco Polo, who was an official in Kublai Khan’s Privy Council. Within a hundred years, the Chinese overthrew the Mongol Yuan dynasty, reclaimed their own country and the Ming (1368-1644) dynasty began. The Great Wall of China was strengthened to prevent another foreign invasion. At this point, Cheng Ho (1371-1435) started the first of seven remarkable voyages, which are believed to have reached as far as Southern Africa. Let us look at the lives of Confucius and Cheng Ho before we update the China story.